November has acted a lot more like a typical December! Lots of snow and lots of temps well below 32 degrees. This hasn’t stopped us from guiding and finding nice fish. 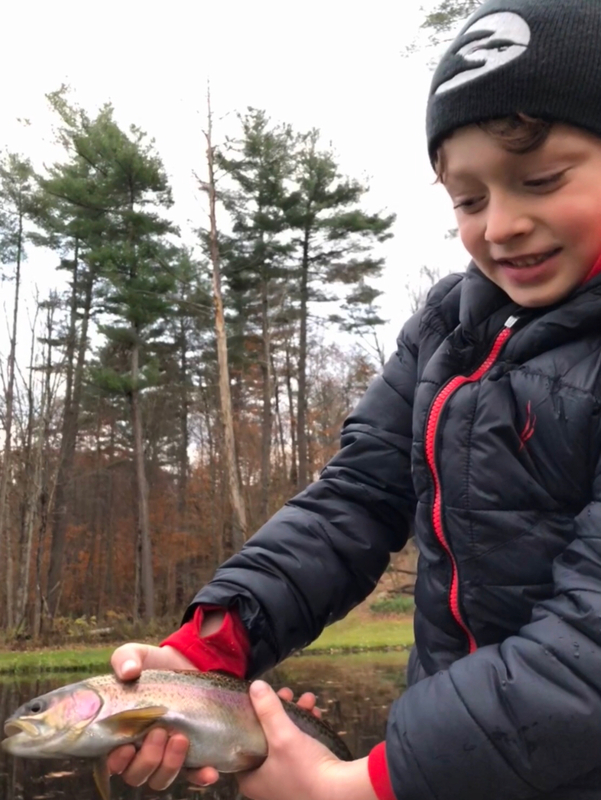 Above photo is my son Henry and a nice Bow he caught in a friends pond on a White streamer recently. I went snowboarding today at the Snow Bowl and fished the Otter before and after. The Bowl opened a full two weeks (or more!) earlier than normal. Nothing to the net but a great combo. 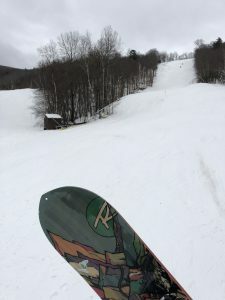 As I was saying lots of snow in Vt right now when Smuggs opened on Friday they reported 56” of natural! Earlier in the month on a small Lake Champlain trib. 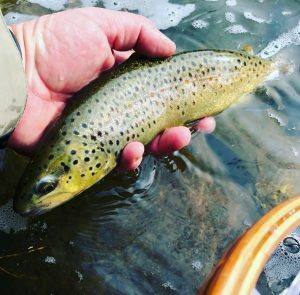 I was searching for Steelhead and catching Browns. We have had some high water so I bet there are some nice LL Salmon and Steelhead in the certain tribs. 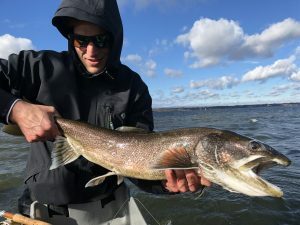 Lake Trout are a blast to target with flies! 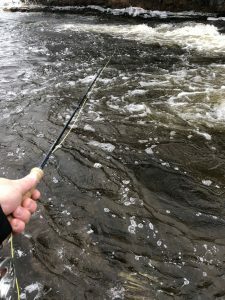 Sinking lines, striping baskets and heavy flies are the norm. Quite possibly the windier conditions are the best although it’s much nicer casting when it’s calm. Still chasing Pike! Caught this one yesterday and had a monster on today. 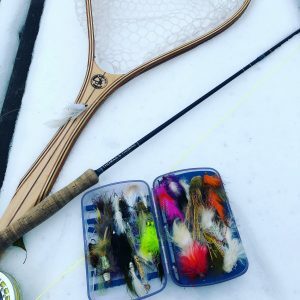 This time of year I’m using smaller flies compared to Summer. Plus creeping them though the water not fast like I would in warmer water temps. 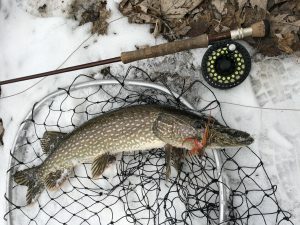 They really fatten up this time of year and several of my biggest Pike have been in late November. 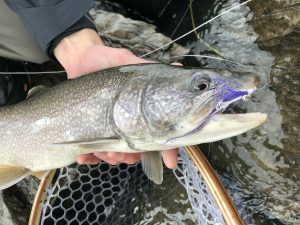 The Big rivers that are still open to fish like the Winooski and Otter are in great shape. They were very high in early November but have been steadily dropping. The Otter went from 2,200 cfs to 1,130 in the last week. For Trout I’ve been swinging and striping streamers but I bet folks who are nymphing are have better success. This week looks mild but still overnight temps in the 20’s and at least one big snow storm in the forecast. Dress warm and be safe on the rivers this time of year. Ice is starting to form so watch your footing around fast water. As always we offer personalized Stream and Brook gift certificates. They make an awesome Christmas present! 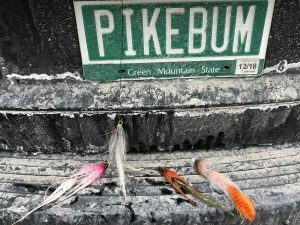 Previous River Report, Thanksgiving Day 2018Next Social Media Giveaway!